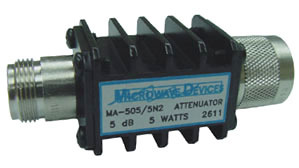 Our MA-505 through MA-560 series of medium power fixed attenuators offer a wide array of attenuation values with power levels of 5 to 60 Watts. These units are constructed to provide light weight along with excellent cooling capabilities. To specify the required attenuation value, replace the 'X' in the model with the attenuation value in dB. MA-530/20D7-2 specifies an 20 dB, MA-530, 2.0 GHz attenuator with 7/16 DIN male/female connectors. * - MA-525L, MA-530L, MA-550L and MA-560L are reduced size versions of the standard MA-525, MA-530, MA-550 and MA-560 respectively. MA-550/18D7-2.5 specifies an 18 dB, MA-550, 2.5 GHz attenuator with 7/16 DIN male/female connectors. MA-550/30D7-3.0 specifies an 30 dB, MA-550, 3.0 GHz attenuator with 7/16 DIN male/female connectors.